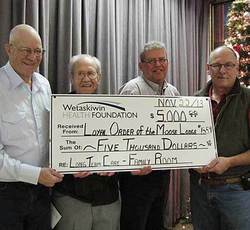 The Wetaskiwin Loyal Order of the Moose #1559 donated $5,000.00 to the Wetaskiwin Health Foundation to assist in development of a Family Room for Long Term Care. The Family Room will make it much easier and more pleasant for family members to visit their loved ones who are in Long Term Care, especially when several family members wish to come together for a visit. In the picture, from the left: are Moose Lodge Administrator, Jim Wilson; The Moose member who made the motion to give this donation, Roy Foster; Ken Ball representing the Board of the Wetaskiwin Health Foundation; and Ward McNary, Governor of the Wetaskiwin Lodge of the Loyal Order of the Moose #1559.